Many of have heard and read about the bombing of Hiroshima and Nagasaki. We know that the Japanese suffered a great deal because of the bombing and we know too that after the bombings, the world changed forever because mankind had now moved into the nuclear age. But do we know how the bombs were developed and why the Americans decided to use them? In this extremely well written book Andrew Langley tells the story of how nuclear fission was discovered and how scientists figured out how to turn the power of the chain reaction into weapons. He talks about the men who were involved in the nuclear program, the Manhattan Project, and explains why the Americans were driven to develop the atomic bomb as quickly as they could because they feared that the Germans and Japanese would achieve this goal before they did. Next the author gives his readers a brief outline of World War II. He goes on to describe how, in 1945, when it became apparent that their war was lost, the Germans finally surrendered. However, the Japanese refused to do so even after they had lost all the territory they had invaded, and even when their cities were being bombed to pieces by the Allies. The Americans estimated that millions of Japanese civilians and thousands of Allied soldiers would die if the conflict continued. And that was when it was decided to drop the bomb on Hiroshima. Even after Hiroshima was flattened by the bomb called Little Boy on august 6th, 1945, the Japanese still refused to surrender. Then it was decided that a second bomb needed to be dropped. Thus, on August 9th, Nagasaki was bombed. The author of this book does not take sides. 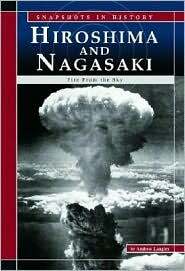 He presents the story as it was and gives his readers lots of information about what took place before, during, and after the bombings of Nagasaki and Hiroshima. He includes many quotations and eyewitness accounts to bring the story to life and to help readers to better understand the circumstances being described. At the same time Andrew Langley makes sure that readers know how horrific the bombings were. Not only were thousands of lives lost at the time of the bombing, but many more people died subsequently because of injuries, radiation sickness, and cancer. He shows his readers that the bombings truly changed the world forever, and that the shadow of those mushroom clouds will never be truly gone until nuclear weapons are forever removed from our world.